Quidt.com is the PUP that uses misleading techniques to prevent removal. Use Reimage to locate malicious components and get rid of them faster than with uninstall instructions. A full system scan blocks virus reappearance and prevents traffic to malicious domains. 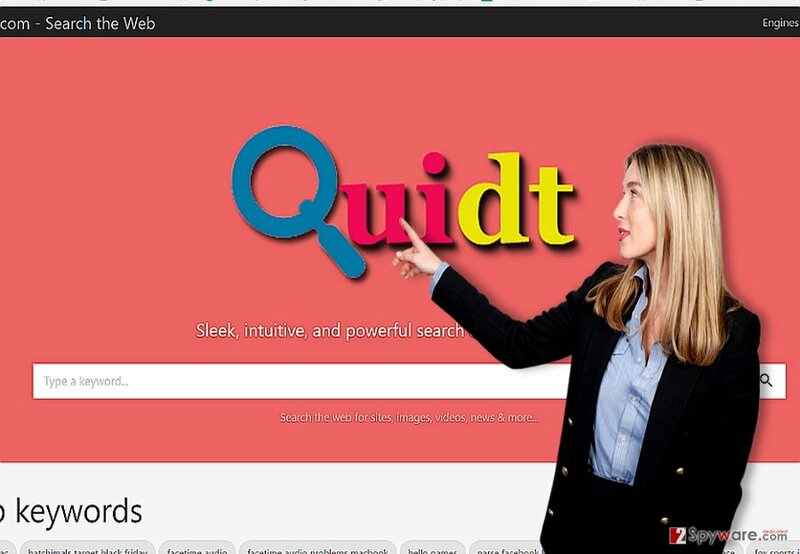 Is Quidt.com a practical search engine? How did this hijacker get into the PC? A website which is visited by hundreds and thousands of unique visitors earns a delicate amount of money for its owners. Likewise, such aspiration encourages users and fraudsters of various ilk to launch their own web pages or create search engine alternatives. In this regard, Quidt.com happens to be one of the samples of the broad category of browsing hijackers. While some potentially unwanted programs do not pose any threat, others might actively direct you to insecure websites monitored by their partners. No one gives guarantees that such domains are protected from malware or complex virus. The half-cut links to sponsored domains is another reason why you should banish Quidt.com from your browser. In fact, the developers of browser hijacker do not care much whether their users run into troublesome virtual malice. If you decide to look for justice, you will hardly find it, since browser hijackers rarely present any credentials. Quidt.com follows this tendency as well. You will not find any hints about the owner company. You can only imagine what information is compiled and how it is managed. Furthermore, do not fall for the seemingly useful quick-access links on the front page. Note that it promotes gaming web pages and links to social networks. The former often happen to be the haven for trojans or other malware. Lastly, Quidt does not support security plug-ins which inform about the ratings of each website. As a result, the risk of visiting a corrupt domain boosts up. All in all, these arguments should encourage you to remove Quidt.com. If you get confused finding the answer when or how Quidt.com hijack happened, let us briefly explain its distribution tendencies. There are two ways how this hijacker settles on your computer. You might run into the official website of this PUP deliberately while looking for a new search engine. Alternatively, it might have set foot on the system under the disguise of a recently downloaded new software. Dashing through the guidelines deprived you of spotting its add-on under “Recommended” settings. As a result, you installed the hijacker along with the intended program. If you are interested in prevention ways, upon downloading any software, opt for “Advanced” method and then deselect unnecessary optional programs. Fortunately, this browser hijacker is not an exquisite virtual menace which causes eradication problems. On the other hand, you should perform Quidt.com removal attentively and without leaving any related components. It would be better to rely on an anti-spyware program. It will remove Quidt.com virus for you faster. Finally, you may check the below-shown instruction for the extra guarantee. Additional security tips should be helpful as well. Here, look for Quidt.com or any other recently installed suspicious programs. Wait until you see Applications folder and look for Quidt.com or any other suspicious programs on it. Now right click on every of such entries and select Move to Trash. You do not only need to remove Quidt.com hijacker but look for unknown or recently appeared extensions. Some PUPs tend to secretly attach dubious browser extensions. Delete them and reset the browser to factory settings. When in the new window, check Delete personal settings and select Reset again to complete Quidt.com removal. Once these steps are finished, Quidt.com should be removed from your Microsoft Edge browser. Here, select Quidt.com and other questionable plugins. Click Remove to delete these entries. Now you will see Reset Firefox to its default state message with Reset Firefox button. Click this button for several times and complete Quidt.com removal. Here, select Quidt.com and other malicious plugins and select trash icon to delete these entries. Click Reset to confirm this action and complete Quidt.com removal. Here, select Extensions and look for Quidt.com or other suspicious entries. Click on the Uninstall button to get rid each of them. Here, look at the Homepage field. If it was altered by Quidt.com, remove unwanted link and enter the one that you want to use for your searches. Remember to include the "http://" before typing in the address of the page. Now you will see a detailed dialog window filled with reset options. All of those options are usually checked, but you can specify which of them you want to reset. Click the Reset button to complete Quidt.com removal process. ^ Pedro Umbelino. Cloudbleed — Your Credentials Cached in Search Engines. Hackaday. Fresh hacks every day. ^ Jacob Kastrenakes . Google will punish sites that use annoying pop-up ads. The Verge. Daily Technology News and Insights. ^ Julia Angwin. Google Has Quietly Dropped Ban on Personally Identifiable Web Tracking. Pro Publica. Journalism in the Public Interest. 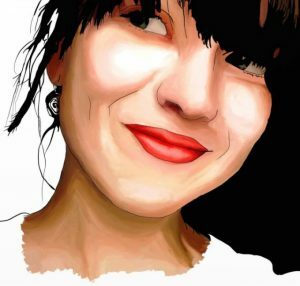 ^ Aaron Sankin. Privacy policies make users trust websites less, not more. The Daily Dot. Your Internet News. ^ Stay a step ahead: RBC gives tips to be cyber smart. CNW. Local news and financial news. This entry was posted on 2017-03-03 at 02:27 and is filed under Stealing programs, Viruses. You can quickly scan the QR code with your mobile device and have Quidt.com virus manual removal instructions right in your pocket. How did you remove Quidt.com virus?